You might be wondering what has happened to Domaphile as of late…. could it be another case of imaginary bedbugs? What could be worse than that? I’ll tell you what – Losing all your data! That might actually be worse than bedbugs. Or at least as expensive. There is some irony in the fact that the content of this blog is mostly about tangible things: stuff you can grow, gather or make. But all of it relies on the ephemerality of the bits and bytes that make up a blog. So, when I woke up a couple of weeks ago, looking forward to a few hours to edit photos for some upcoming posts, I was disturbed to find my trusty hard-drive wouldn’t boot up on my computer. hmmm. What would be the chances? After some testing on various computers, I headed to the Apple store where they confirmed that my LaCie 500GB external hard drive that I use to store my photo library (and all my other data for that matter) was on the fritz. What timing for this to happen on the rare day that I had to actually work on the blog! But I wasn’t too upset (yet), because having learned the hard way before, I back up my data! It had been a couple of weeks since I had backed up my hard drive to my larger Iomega Terabyte drive that serves as the household backup for all our devices, so I knew I would lose some recent files, but I headed home to see what was there. Once home, Murphy’s law went into full effect….. I couldn’t get into the drive. 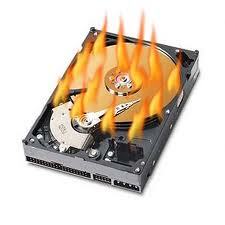 In total disbelief, I took both hard drives to Tekserve to confirm the worst: all my data was gone. I had spent a good deal of time over the past few weeks experimenting with and documenting various projects: re-usable bowl covers, homemade toothpaste, walnut-date balls… gone. My daughter’s 6th birthday party. Gone. Gone. Gone. At least the folks at Tekserve are skilled at giving out this kind of news and they are extremely sympathetic, offering tissues and everything. Plus, they give out free Cokes in glass bottles which is a nice touch. The drives come with an internal fan and can stay plugged in for a long time. I like their retro-design. Not exactly legitimate, but still. Download my photos from my camera to my small glyph drive I use every day. Copy my Aperture library from the small Glyph drive to my main computer that is automatically backed up by the big Glyph via TimeMachine. Once the photos are backed up, then reformat the SD card. Consider cloud storage: SpiderOak, Crash Plan and Mozy have been recommended. So that’s my story. Oddly, most people I have spoken to have some sort of lost data tale. What do you do to back up your data? I welcome all your advice so I can figure this out and get back to blogging about toothpaste. This entry was posted on March 26, 2012, 5:37 pm and is filed under helpful hints. You can follow any responses to this entry through RSS 2.0. You can leave a response, or trackback from your own site. i do have icloud but do not actually know what it stores. however, i do have a notebook back up that i try and do every 10 days. you are supposed to keep it hooked up all the time – but, since it’s a laptop – it’s hard to do – but, in addition – and i highly recommend this – i have carbonite. carbonite is a back up service over the internet. so, if i’m traveling somewhere – and i want to take my laptop – i don’t have to schlep my notebook as well because it’s automatically being backed up wherever i am (as long as there is wifi). you should really have 2 backsups – especially for photo’s. First, I’m so sorry for your loss. I knocked my ext. drive off my desk and 6 yrs or so of photos were gone. I still have the drive in hopes that someday I can get the data out of it. Second, thanks so much for sharing your equipment choices and backup protocols. I will definitely reference your post as I improve the security of my data. I feel your pain and I’m sorry to say your disaster is a good reminder for the rest of us. So glad you were able to get your data recovered! Lost data is the worst! we all have been there, but it doesnt make it any better. Six months into my senior thesis this happened to me. Needless to say recovery didn’t happen.